Drs. 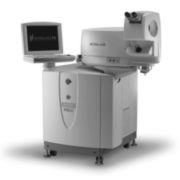 Beers and Liu are one of the few surgeons in the Bay Area to use the IntraLase™ FS Laser to achieve the sharpest, clearest vision for their patients. Although the microkeratome blade generally used is safe and effective, there are certain situations in which IntraLase provides a better result. Although it may not seem obvious, even small improvements in your vision can result in a much higher quality of life. The IntraLase Method is a 100% blade-free technique used to perform the critical first step in the LASIK procedure: creating the corneal flap. The creation of the corneal flap prepares the eye for the second step of the LASIK procedure, where the VISX STAR 4 IR™ Excimer laser is used on the inner cornea to correct vision. IntraLase can be an important option for patients with thin corneas or who have a corneal epithelial dystrophy. The IntraLase Method uses tiny, rapid pulses of laser light to create your corneal flap—instead of using a metal blade—during the first step of LASIK. Each pulse of light passes through the top layers of your cornea and forms a microscopic bubble at a specific depth and position within your eye that is determined by the doctor. The IntraLase® laser moves back and forth across your eye, creating a uniform layer of bubbles just beneath your corneal surface. Just prior to applying laser vision correction, the doctor creates your corneal flap by gently separating the tissue where these bubbles have formed. The corneal flap is then folded back so the doctor can perform the second step of your LASIK treatment. "It's a miracle. It's heaven. LASIK is the best technology available. It's great."